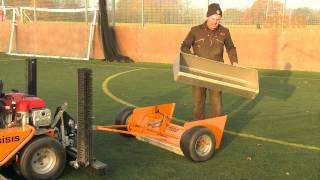 The Sisis SSS1000 is an ideal tool for artificial and synthetic turf maintenance and this video shows the machine in action. The SISIS SSS1000 is a tractor mounted rotary brush sweeper for use on artificial turf surfaces. It removes surface debris, lifts pile and redistributes sand or rubber crumb infill, giving your artificial surface maximum performance and life.